The Carbon River “trail” is the remnant of a gravel road that, at one time, led from Mt. Rainier National Park’s northwestern corner to the Carbon Glacier and provided access to several short trails with such destinations as the Old Mine, Green Lake, Chenuis Falls, and Ipsut Falls. However, the river’s extensive flooding over the years repeatedly washed out portions of the road, rendering it too costly to maintain. The road is now closed to vehicle traffic beyond the park boundary, but is maintained in good enough repair to permit access to the side trails by foot and mountain bike as far as the Ipsut Creek Campground. 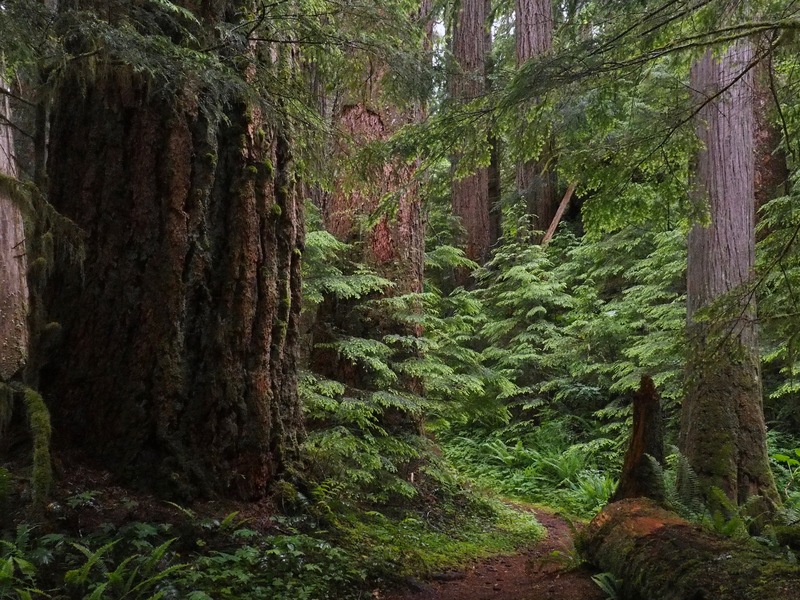 Just beyond the campground, the trail joins the park’s Wonderland Trail that circles Mt. Rainier. Although bikes are not permitted on the side trails or beyond the campground, the Park Service has installed bike racks at a few spots along the way to facilitate quicker access to those wayside features. Given the number of side trails that may be hiked singly or in combination from the main trailhead, the round-trip distances above are given for each individually. Other than the occasionally passing hiker or biker, little else breaks the shadowy silence of the old-growth rainforest but the twittering of birds and the river’s meandering murmur. The flat Carbon River Trail permits an easy stroll through misty, old-growth rainforest garbed in moss and ever within earshot of its namesake’s rushing waters. The Carbon River Valley contains the only rainforest within Mt. Rainier National Park and one of few remaining patches of North American rainforest inland and apart from their more common coastal ranges. Carbon River Trail, June 11, 2017. The main trail generally parallels the Carbon River, which, rather than flowing in a single stream, consists of several braided strands across its flat, flood-prone valley. At times, the river runs milky with silt ground from stone by the glaciers above, which, as it deposits, alters the river’s ever-shifting channels. Here, the river zigzags below Chenuis Mountain’s Tirzah Peak. Carbon River Trail, June 07, 2015. To the south (right) of the park entrance, boardwalks carry the Rainforest Loop Trail on a 0.30-mile/0.50-km interpretive tour of classic rainforest habitat. The loop trail also provides access to the park’s longer Boundary Trail. Carbon River Rainforest Loop Trail, June 11, 2017. Thick moss pads most surfaces of the rainforest. 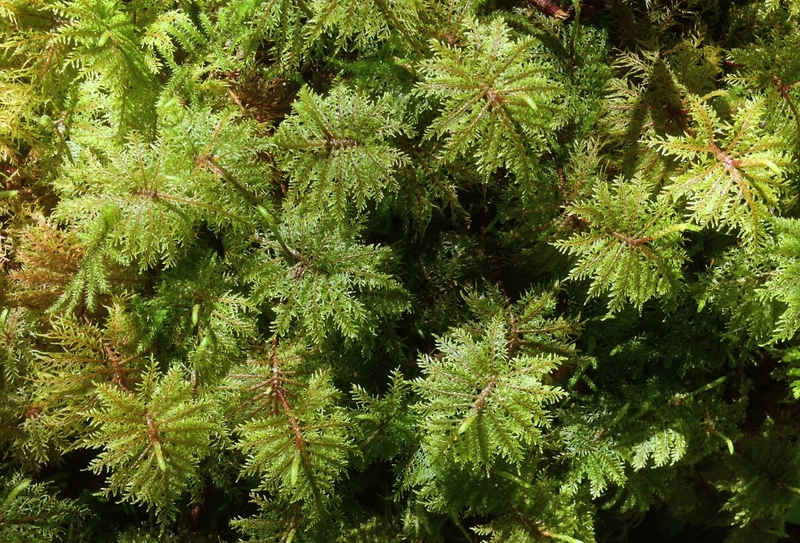 Hylocomium splendens, known by several accurately descriptive common names, e.g., glittering wood-moss, stairstep moss, and mountain fern moss, grows especially luxuriantly. Carbon River Trail, May 11, 2014. In the deep woodland shadows, look for mostly pallid blooms peering out of mossy nooks, including, clockwise from top left, queen’s cups (Clintonia uniflora), western bunchberries (Cornus unalaschkensis), Siberian springbeauty (Claytonia sibirica), Pacific trilliums (Trillium ovatum), two-leaved false Solomon’s seals (Maianthemum dilatatum), false bugbane (Trautvetteria caroliniensis), and salal (Gaultheria shallon). 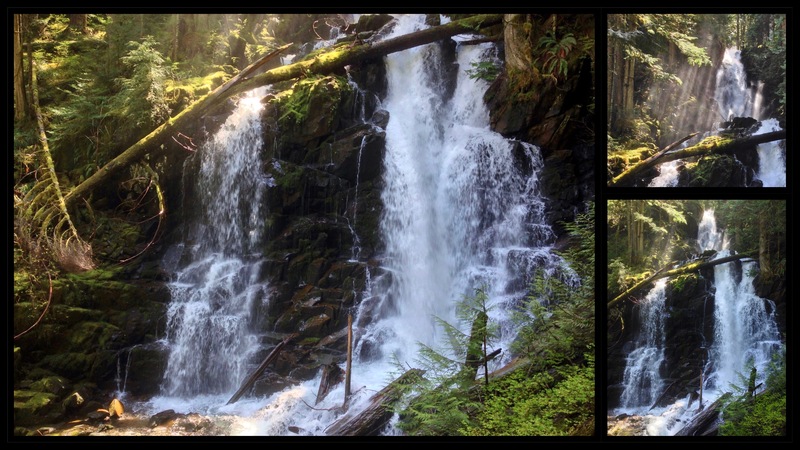 Carbon River Trail, May 11, 2014, June 11, 2017, and June 25, 2018. At approximately 1.30 miles/2.00 km from the main trailhead, the Old Mine Trail, marked only by a very small sign, leads to the right from what used to be a small parking area. The 0.30-mile/0.50-km trail is relatively flat until it reaches the edge of the river valley and then climbs steeply to its abrupt end at the entrance of an abandoned mine shaft. Carbon River Old Mine Trail, May 11, 2014. Leading a short distance directly into the mine shaft, the Old Mine Trail provides an eerie view down its gorge. 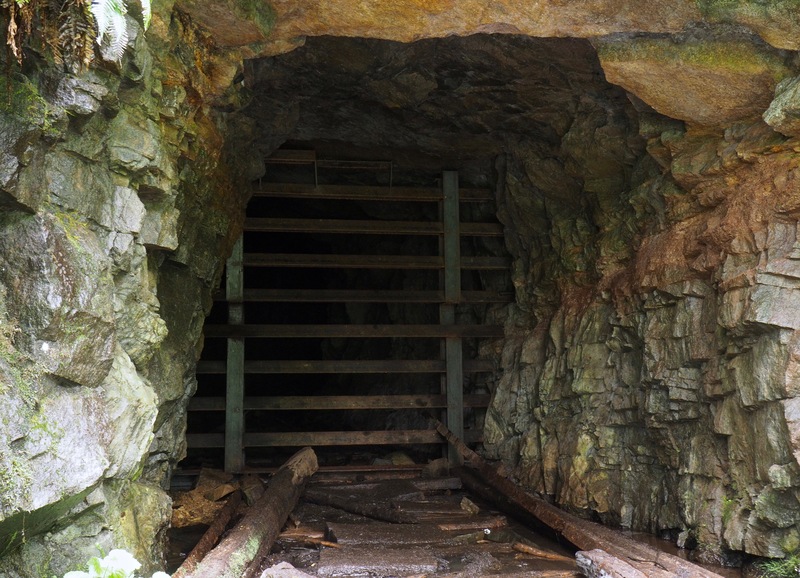 The shaft was likely bored by the Washington Mining and Milling Company around 1910. Although local lore refers to it as a copper mine, sources suggest that the company dug thirty-odd shafts in the area to explore for gold and silver as well – and as cover for illegal logging operations within the park. No significant minerals being struck, the company gave up its mining claims in the park within a few years. Carbon River Old Mine Trail, June 11, 2017. Beyond the Old Mine trailhead, the Carbon River Trail continues through quiet, old-growth forest. Carbon River Trail, June 11, 2017. 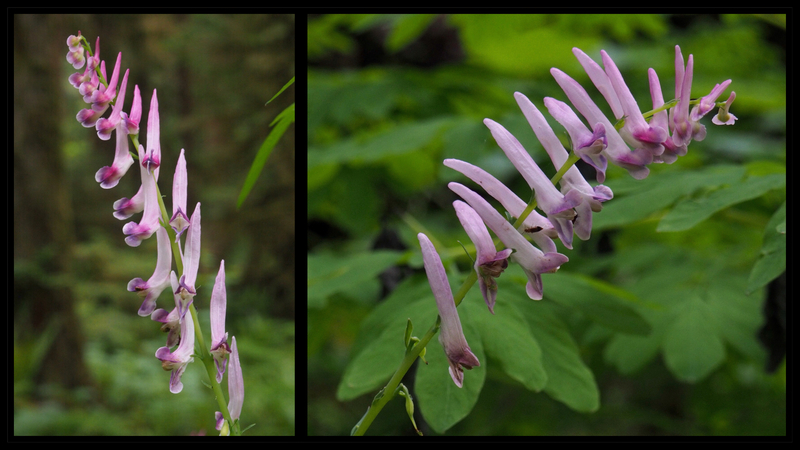 The floral star of the spring rainforest is the delicate, yet nearly alien-looking Scouler’s corydalis, or, Scouler’s fumewort (Corydalis scouleri), which blooms in knee-high banks along the main trail and the Old Mine Trail. Carbon River Trail, June 11, 2017. At approximately 3.30 miles/5.30 kilometers from the main trailhead and just beyond sight of Tirzah Peak, the 1.50-mile/2.40-km side trail to Green Lake begins on the right where Ranger Creek intersects the Carbon River Trail. The side trail climbs moderately through old-growth, coniferous forest replete with ancient giants. Some Douglas fir (Pseudotsuga menziesii) along the trail are known to be over eight hundred years old. Carbon River Green Lake Trail, June 25, 2018. Several toppled titans span the side trail to Green Lake, topped by seedlings of the next generation. Carbon River Green Lake Trail, May 11, 2014. Fanciful fungi abound in the woody upland along the Green Lake Trail. 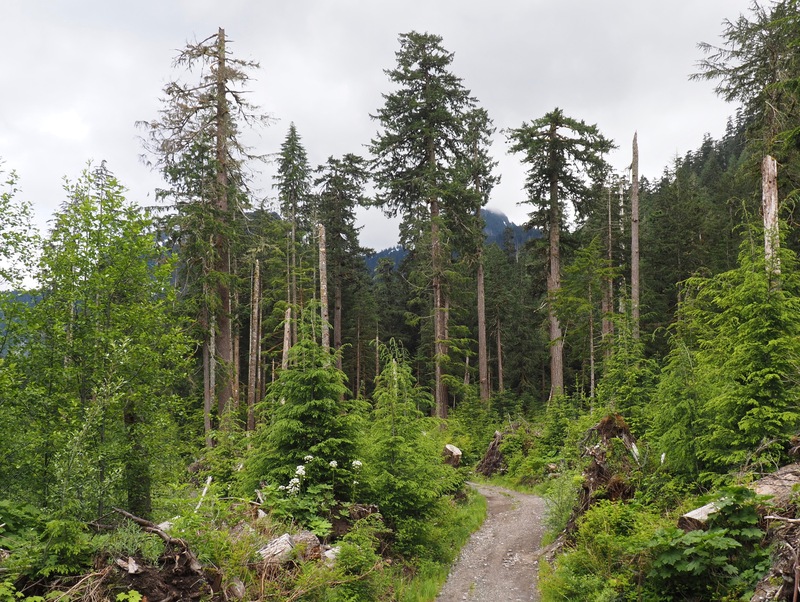 Carbon River Green Lake Trail, May 11, 2014, June 07, 2015, and August 15, 2015. 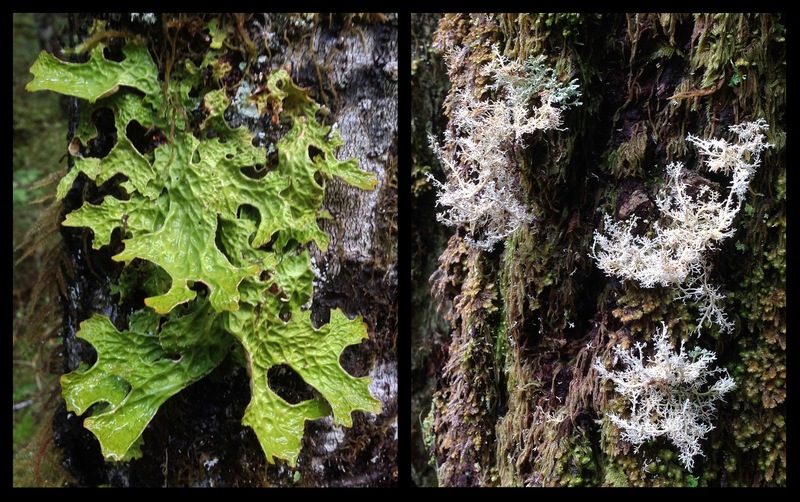 Lichens also flourish in the rainforest’s abundant moisture. Long thought by morbid imaginations to resemble lung tissue, the lungwort (Lobaria pulmonaria) (left) is sensitive to air pollution and is thus an indicator of woodland health and maturity. Like a wintry forest in miniature, tiny ball lichens (Spaerophorus sp.) (right) spread delicate branches across their treeside barkscape. Carbon River Green Lake Trail, May 11, 2014. Approximately one mile/1.60 kilometers from the Green Lake trailhead, a short side trail leads left to a view of Ranger Falls, where Ranger Creek roars over its rocky escarpments. Most often shrouded in deep, woodland shadows, Ranger Falls is sometimes backlit dramatically by mid-day’s soft, mist-laden sunbeams. Carbon River Green Lake Trail, May 11, 2014. Shortly before lakefall, the trail flattens and Ranger Creek’s docile meander seems a world apart from its thunderous plunge over Ranger Falls. Carbon River Green Lake Trail, May 11, 2014. The aptly named Green Lake lies in the deep basin formed by Gove Peak and Arthur Peak. Tolmie Peak tops the distant horizon. Carbon River Green Lake Trail, June 07, 2015. 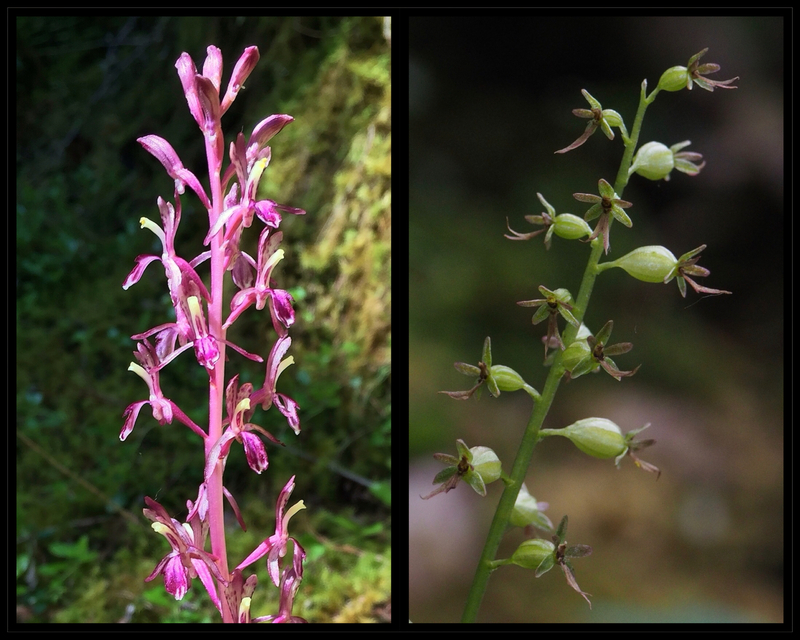 Pacific Northwest orchids thrive in the trailside rainforest. Resplendent in shafts of sunlight, Pacific coralroots (Corallorhiza mertensiana) nevertheless bloom directly from the forest floor without the aid of leaves, chlorophyll, or light by subsisting solely on fungi in the soil (left). By contrast, their tiny green relatives, the heart-leaf twayblades (Listera cordata), appear nothing but chlorophyll and spring from single pairs of namesake leaves below their slender stalks (right). 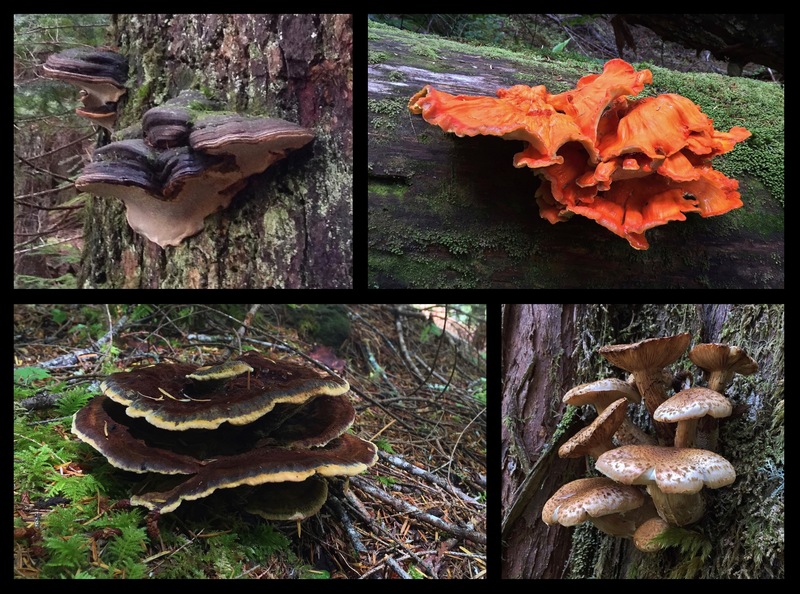 Carbon River Trail, June 07, 2015 and June 11, 2017. Beyond the Green Lake side trail, the Carbon River Trail edges nearer the river, where groves of red alder (Alnus rubra) spring up in the absence of larger coniferous trees. Carbon River Trail, June 07, 2015. 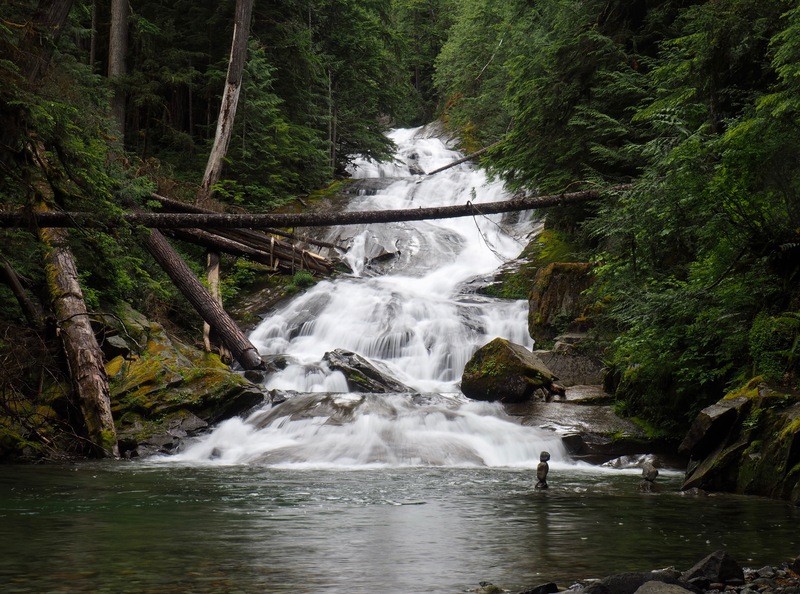 At approximately 3.80 miles/6.10 km from the Carbon River trailhead, the side trail to Chenuis Falls leads left toward the river. 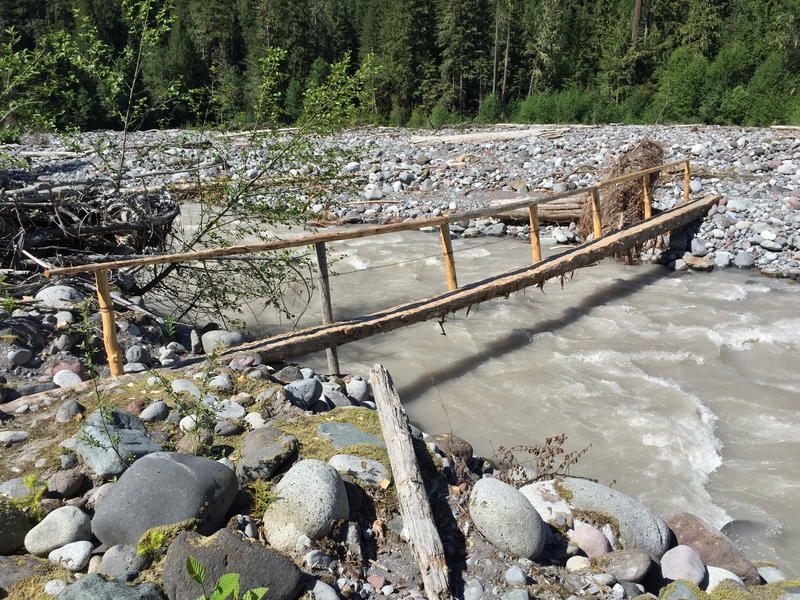 When not washed out by high water, log bridges span the various river streams along the quarter-mile/0.40-km side trail, which generally disappears into the vast gravel bar that is the riverbed. After crossing the first bridge, angle downstream and listen for Chenuis Falls rushing just beyond the forest hem. Carbon River Chenuis Falls Trail, June 07, 2015. Near its entrance to the Carbon River, Chenuis Creek descends Chenuis Falls‘ grand staircase. Carbon River Chenuis Falls Trail, June 25, 2018. 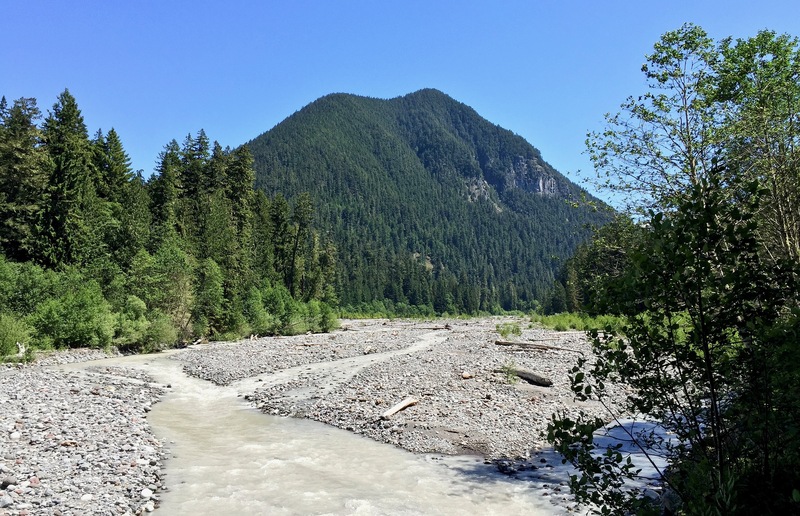 Beyond the side trail to Chenuis Falls, the forest along the Carbon River Trail opens where high winds and fickle river waters have felled swaths in wide-ranging forays. Carbon River Trail, June 11, 2017. 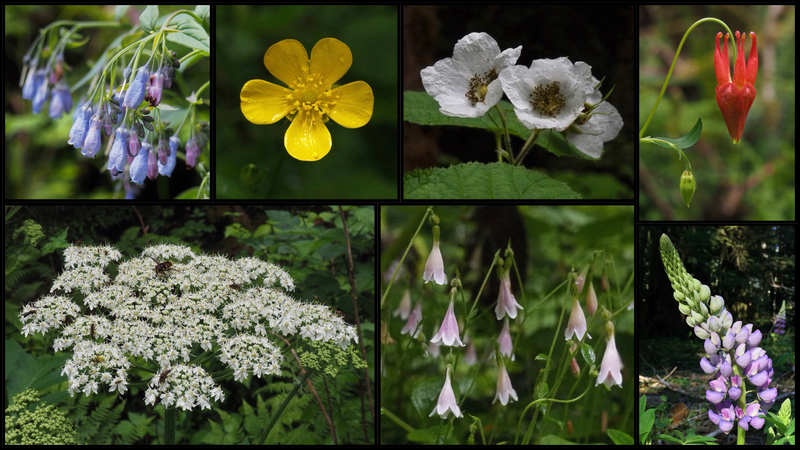 In brighter stretches of trail, look for more flamboyant blooms, including, clockwise from top left, tall bluebells (Mertensia paniculata), creeping buttercups (Ranunculus repens), thimbleberries (Rubus parviflorus), western columbines (Aquilegia formosa), bigleaf lupines (Lupinus polyphyllus), American twinflowers (Linnaea borealis), and common cow-parsnips (Heracleum maximum a.k.a. H. lanatum). Carbon River Trail, June 2015, 2017, and 2018. Beyond the Ipsut Creek Campground, log bridges cross stony streams into deep forest toward the Carbon River Trail’s junction with the Wonderland Trail that girdles Mt. Rainier. Carbon River Trail, June 07, 2015. Approximately 0.30 miles/0.50 km beyond the Ipsut Creek Campground, a moss-lined side trail leads a short distance to Ipsut Falls beneath remnants of fallen forest. Carbon River Ipsut Creek Trail, June 07, 2015. At Ipsut Falls, Ipsut Creek dashes down a contorted slot jammed with logs and jumbled boulders. Carbon River Ipsut Creek Trail, June 07, 2015.